We are leading exporter, trader and supplier of an exclusive range of Antique Reproduction, designed as per the norms of the industry. A beautiful work on brass to accentuate the security of your home/office and to add positive vastu energy to your premises. It's a fully functional lock. Beautiful iron made vintage style cannon exclusive available at InterioCrafts.Happy Shopping at Interio Crafts. For catering the variegated needs of our clients, we are deeply engrossed in offering a qualitative array of Mughal Style Brass Lock. 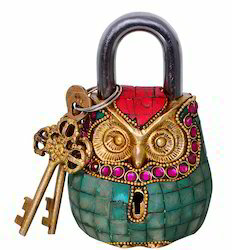 We are one of the foremost firms of Antique Padlock. Besides, we present this product at nominal rates to our customers. We produce a complete range of the finest quality antique reproduction hardware that is a true form of reproduction and are made using 18th century craftsmen guide. In our antique reproduction profile, we have carefully recreated the expertise of that period. We take immense pride to offer unique art with matchless designs. - Packaging: This product will be packed with bubble paper, shredded paper and corrugated box. We are one of the well-distinguished companies in the market that are into offering Antique Door Lock. 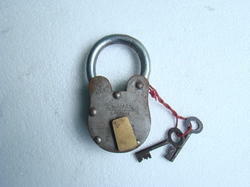 Our company has achieved widespread recognition in providing Mini Fish Antique Lock.